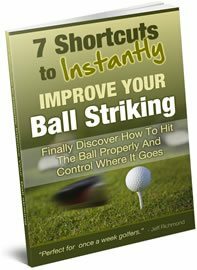 If you want to hit longer golf drives then you’re going to love this article because you’ll discover exactly what you need to work on to hit longer drives, along with a great golf drill to help you accomplish it. You see, an American company did some research into those golfers that hit long drives and those golfers that don’t. Interestingly what this company discovered was that the real difference between longer hitters and shorter hitters is not shoulder turn, but the early stages of the downswing. This company found that longer hitters increase the gap between the hips and shoulders by almost 20 percent as the club is starting the downswing. Whereas shorter hitters only had a 13 percent increase in the gap between their hips and shoulders. So how can you use this information to help yourself in your own golf swing so you can hit longer drives? If you want to hit longer drives you need to focus on widening the gap between your hips and shoulders on the downswing, and here’s how to do it. Get your driver and setup to a golf ball as your normally would. Then, keeping your body in the same setup position, pick up your golf club and position it over the back of your shoulders behind your neck. Once in position then rotate your shoulders as though you are making your backswing turn, making sure to turn them as far as they will go. Just before you reach your furthermost backswing position move your front knee back towards the target and rotate your front hip towards the target. While you’re doing this try to keep rotating your shoulders back away from the target, as if to complete your backswing. This will mean that for a quick moment your body will be going in two different directions at the same time. Your upper body will still be moving back to complete the backswing, and your lower body will be moving forward toward the target – thus widening the gap between your shoulders and hips. After some practice at this you should then try to do this same move while you’re actually swinging the golf club. To do this simply setup to a shot as normal and then swing back slowly. Then once you get close to the top of your backswing move your left knee towards your target and continue your backswing, trying to turn your shoulders away from the target. Naturally, you’ll get to a point where you can no longer do this and so you should start your downswing and follow-through. The point of this drill is to try to train your body to move in two different directions at once to help you hit longer drives. 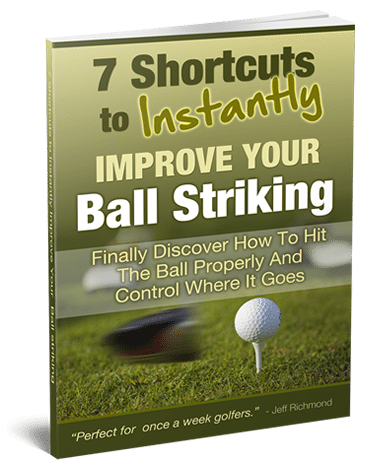 It’s a tough move to perfect but with practice and persistence you can do it and reap much longer golf drives as a result.